Crafty Drinks November: Arlington Edition! Yo crafty peeps! Timer for another happy hour already? Thank goodness. This month, we're taking Crafty Drinks DC to NOVA to chill out at Galaxy Hut in Clarendon; beer, bar grub, and Pac-Man & Galaga (had to click on that link to know the reference? Damn whipper-snappers with your XBox and your air conditioning). Come on out and meet your friendly neighborhood crafters, learn something new, make friends! Open Adoptions at Holiday Heist! This year we are very excited to announce that, in addition to donating all proceeds from our raffle drawings to the Washington Humane Society, we have also invited them to bring some very lovable, very sweet dogs and puppies that need homes for an open adoption during the Holiday Heist! If you have the room in your hearts and in your homes, please come by to meet some wonderful companions who are looking for their perfect match. Washington Humane Society (WHS) is the only Congressionally-chartered animal welfare agency in the United States, and has been the area’s leading voice for animals since 1870. As the only open-access shelter in the Nation’s Capital, the Washington Humane Society provides comfort and care to over 30,000 animals each year through its broad range of programs and services including sheltering, adoption, spay and neuter, CatNiPP, humane law enforcement, lost and found, human–animal therapy programs and humane education. WHS enforces all of the District's animal laws under an 1870 Congressional charter, and all animal control laws under contract with the DC government. WHS operates the only open-access shelter in Washington, DC; a private shelter on 7319 Georgia Avenue, NW, and the DC Shelter (under contract by the Department of Health) on 1201 New York Avenue, NE. In addition to the two animal shelters, WHS operates a low-cost National Capital Area Spay & Neuter Center, on 1001 L Street, NE, located in the heart of Capitol Hill, a new animal training facility located on 7315 Georgia Avenue, NW, and the administrative offices, located on 4590 Macarthur Blvd. NW. WHS has ninety dedicated employees, twenty-two distinguished members on the Board of Directors and more than three-hundred and fifty active volunteers; now, you have an opportunity to be a part of their good cause. Adopt a friend, donate money or enter our raffle for some great prizes. Either way, you'll feel great and help a furry friend find a home. This beautiful piece, as well as other great prizes, will be given away at the door of the Holiday Heist Craft Show! Yes, it's that easy; win a gift just for showing up. Yes, we are that fabulous. You're welcome. The Mafia is looking for a few good henchmen (and women) to help us plan the Heist. Lock-picking experience not necessary; we're willing to train. •Carry out hits, contracts & vendettas. Got a crafty business? The Family will be happy to exchange juice for favors; free advertising on our site, blog and at the Heist. Lana Kole is a budding, independent design label and also a fabulous human being! Lana means "a beautiful place" and Kole means "a victorious people." At the Lana Kole Studio, we seek to inspire and encourage people by helping them make their living/work spaces more vibrant and beautiful with our modern and fun take on traditional interior decor. Everything we create will be designed with this objective in mind. We promise! Inspiring our clients through our design is very rewarding. We hope this idea is reflected in each of our hand-crafted products. Our aesthetic derives from a love of nature and modern simplicities. Our designs are an eclectic collection of our own hand-drawn and original computer-drafted art work. The Lana Kole Studio has been in existence since January of 2008 and is based in Baltimore, Maryland (USA). We ship our handmade products all over the world. We are so excited that people in places like Australia, Canada, United Kingdom, Africa, and Asia- all places we've never visited- have our products in their homes. It is truly humbling and inspires us to keep designing and keep inspiring. We specialize in surface and textile design. Our product line includes vinyl surface graphics and vinyl lettering, fun stationery sets, and originally designed textiles that we use to make our collection of modern home decor. We are also currently designing a fabulous wedding and events collection. We're just getting started. We have many more products and ideas in store. We at Lana Kole believe in the power of social networking. It's Lana Kole's dream to appear on Martha Stewart, Oprah, and Rachel Ray show in 2010. If you know somebody, that knows somebody, that knows somebody, who knows a neighbor that knows somebody that knows these 3 fabulous ladies... please let us know. If you think you can help, contact them here! Find Lana Kole on Etsy and at our Holiday Heist Craft Show! Erdenesuren Davaasuren designs and knits jewelry with marble stones and colorful recycled papers. She also designs and knits hats, scarves, laptop sleeves, wallets, purses, and gift boxes in her tiny bedroom in DC in addition to being a full time undergraduate student. Why we love Erdenesuren: Her designs are multicolored because she strongly believes that life is so much less stressful and happier when things are handmade colorfully. We happily agree. She tries to make her products as eco-friendly as possible by using colorful recycled papers, buttons, and marble stones. She designs her own patterns and she is constantly delivering new and awesome products in her effort to better the future of “all things handmade”. She draws and paints on used scrap papers to use them as wrapped fillings in her knit jewelries. Love to see more? You can find Erdenesuren at our Holiday Heist Craft Show! Moonlight Bindery's Katie Wagner makes the craft of bookbinding fun, beautiful and extraordinary. Got writer's block? No worries; just procrastinate while playing with Legos. "I had so much fun making these chalkboard journals. The journals are covered in black oilcloth that you can write on with chalk markers. Put a quote on the cover or your grocery list! The marker is erasable with a damp cloth." We love it! Who knew that the outside of a book can be as much fun (or more) than the inside? You can find these and more of Moonlight Bindery's wonderful books at the Holiday Heist craft show! The DC Craft Mafia is a diverse group of indie crafters and proud to be a chapter of the world-wide Craft Mafia. Our goal is to bring craftiness to the capital masses through workshops, craft shows and community outreach. 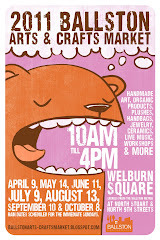 and the Ballston Arts & Crafts Market Supports Us!